Ohh, February you cruel mistress. Christmas is but a memory and those sweet chocolate bunnies of Easter seem a mile off. All we’ve got to look forward to is dark skies and endless rain for a while. But London Pride might make you feel differently about the eternal grey gloom. Because every time it rains this month, they’re giving away FREE beer! 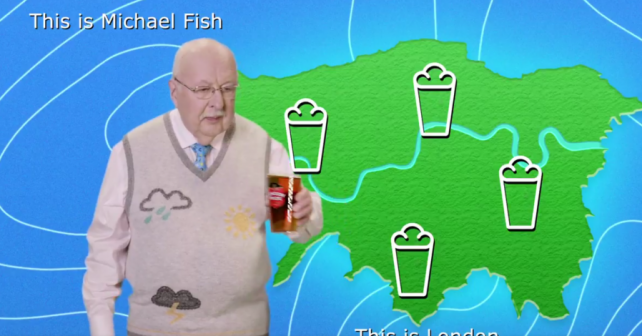 They’ve even recruited legendary weatherman, Michael Fish. All punters need to do is follow London Pride on Twitter, keep a beady eye on their weather report and when it rains, tweet them with the #WhenItRainsItPours hashtag and ask for a free pint! It’s that easy. Then go down to your local participating Fullers boozer to cash in your code for a gratis jar of Pride. It’s one code, per person per day but let’s be honest that’s should still be a shedload of FREE grog this month! Code must be redeemed by midnight the following day. To check for participating pubs, click here. Check out the full Terms & Conditions.